The common causes affecting the pulp are a cracked tooth, a deep cavity, and repeated dental treatment to the tooth or trauma. 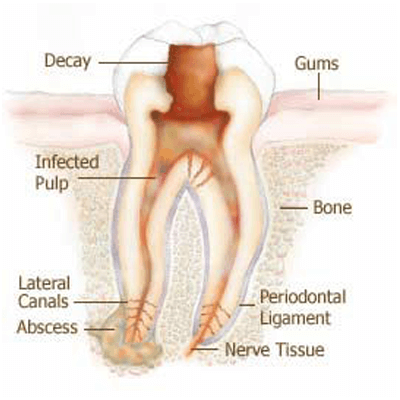 The term "root canal" comes from cleaning of the canals inside the tooth's root. A Deep Infection: Root canal treatment is needed when an injury or a large cavity damages the tooth's root. The root becomes infected or inflamed. A Route to the Root: The dentist numbs the tooth. An opening is made through the crown of the tooth to the pulp chamber. Removing the Infected/Inflamed Tissue : Special files are used to clean the infection and unhealthy pulp out of the canals. Then they shape the canals for the filling material. Irrigation is used to help clean the canals and remove debris. Filling the Canals: The canals are filled with a permanent material. Typically this is done with a material known as gutta-percha. This helps to keep the canals free of infection or contamination. Rebuilding the Tooth: A temporary filling material is placed on top of the gutta-percha to seal the opening. The filling remains until the tooth receives a permanent filling or a crown. A crown, sometimes called a cap, looks like a natural tooth. It is placed over the top of the tooth. Extra Support: In some cases, a post is placed into the root next to the gutta-percha. This gives the crown more support. The Crowning Touch: The crown is cemented into place.